Exercising without music to most is almost unrealistic. With summer around the corner, there’s already an influx of people getting back into the gym (whether that’s once or twice, or six times a week) and for most, working out without music would probably take away the enjoyment of the experience as a whole perhaps even make it rather boring. When it comes to headphones in particular, there are numerous models out there with different shapes and sizes. Audio-Technica, worldwide group of companies creating high-performance microphones, headphones, wireless systems, mixers and electronic products, have you covered with a number of headphones tailored more towards those who exercise and work out, and today we highlight their best (depending on what type of exercise you partake in). The ATH-SPORT3 are THE ultimate in-ear sport headphones. Music without the restraints, these wireless babies are perfect for the serious athlete who demands prolonged comfort and a high level audio performance to soundtrack their intense workouts. Featuring a flexible but secure ear hanger design and soft silicone housing for added comfort, these in-ear headphones sport 10mm drivers that deliver dynamic and detailed fidelity. To control the air flow and produce rich bass sounds when out running, a waterproof IXP5-certified duct has been fitted along with integrated stabilisers to minimise any sonic distortion. Yep that means they can withstand exercise in the rain or during an intense workout AND they can also be washed under a running tap after a long workout or run. All that’s left to do is hustle for the muscle. Oh and they’re only $69.95! You beauty! When it comes to raw sound quality, nothing beats the sense of scale a pair of decent over-ear headphones can provide, and that’s what you want when you’re in a noisy gym focusing on your lift. Audio-Technica excel here, with the ATH-M50x perfect for you getting the most out of your leg or back day. These ones deliver accurate audio and outstanding comfort, with contoured earcups that seal tight for excellent sound isolation, with minimal bleed. And the pro-grade materials are durable, yet comfortable. While they’re not wireless (and not specific for working out), they do have interchangeable cables if you want a short straight option that doesn’t get in the way too much. Obviously we wouldn’t recommend these for running, and maybe steer clear of snatches or cleans, but otherwise these babies are perfect. They are also available in two limited editions, one with rich red earcups and a touch of gold – an instant classic, or the bright blue earcups with a dark ring for those who like to make a statement. A step above earbuds in terms of size and just below over-ear pairs, the ATH-SPORT70BT wireless in-ear headphones feature 9 mm performance-enhanced, carbon-coated drivers to deliver amazingly clear and powerful audio to fuel your workouts. 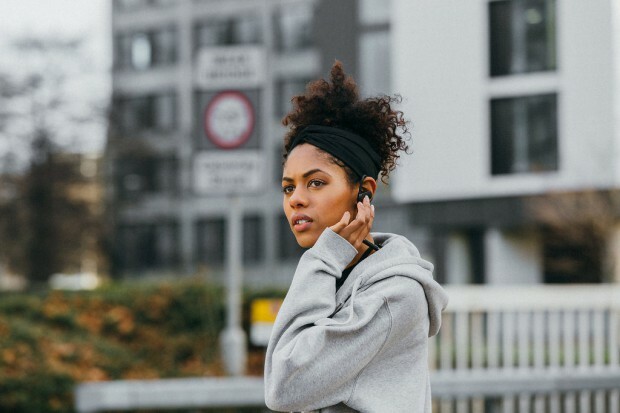 The comfortable ear-hook design keeps the headphones securely in place, allowing you to stay active while remaining connected to your phone or other Bluetooth wireless device – and you’ll get around six hours of continuous use (so no stress if you’re up for a longer workout). The in-line mic and controls let you easily answer calls and control your music, and the switchable ambient noise hear-through function (activated simply by tapping the left housing) gives you the choice of hearing the sounds around you for safer use outdoors. What’s more, is that they’re also IPX5 Waterproof Certified – meaning you can wash them off when your workout is through. This is a solid pair of headphones for runners or those may be moving around a bit more than a weight lifter. For all their options, browse online at audio-technica.com.au.